BAYTOWN, Texas – A perfect reaction time at the starting line earned Harley-Davidson® Screamin’ Eagle®/Vance & Hines rider Andrew Hines a 0.0077-second, hole-shot victory over Lucas Oil Buell rider Hector Arana Jr. in the final round at the O’Reilly Auto Parts NHRA Spring Nationals at Royal Purple Raceway. Riding a Harley-Davidson® V-Rod® motorcycle, Hines scored his first win of the season and the 26th of his career, and now leads the NHRA Pro Stock Motorcycle class in points. It was also the third consecutive win for Hines at the Houston track. Arana Jr. set the low Elapsed Time of the weekend with a 6.846-second pass in the third round of eliminations on Sunday, and never ran slower than 6.897 seconds. Hines’ best pass coming to the final round was a 6.902 run in the first round. Hines qualified fifth for the event with a time of 6.877 seconds. 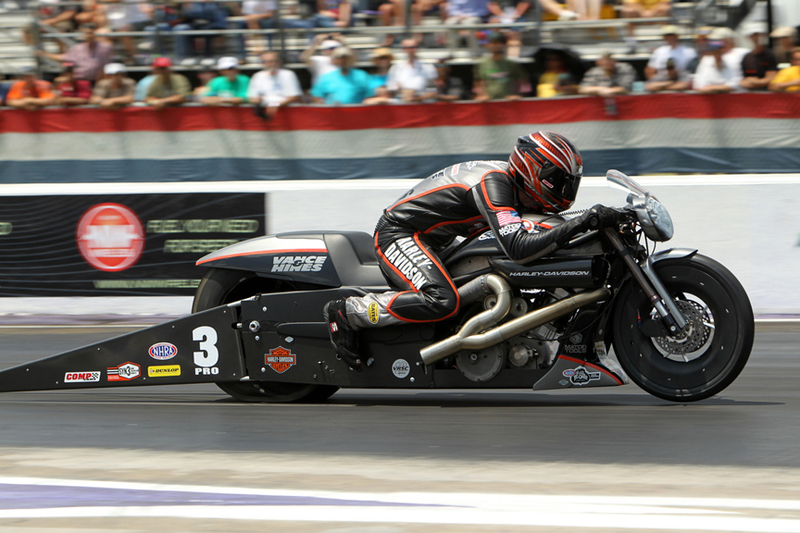 Harley-Davidson Screamin’ Eagle/Vance & Hines rider Ed Krawiec qualified the team’s second V-Rod in third place at 6.864 seconds. Hector Arana Sr. was the top qualifier at 6.850 seconds on a Lucas Oil Buell. Krawiec, who won the opening event of the season at Gainesville, Fla., defeated Jerry Savoie on the Savoie Alligator Farm Buell in the first round of eliminations on Sunday. Krawiec lost on the second round to Geico Suzuki rider Karen Stoffer. Hines got wins over Suzuki Extended Protection rider Jim Underdahl and John Hall on the Sovereign/Star Racing Buell in the first two elimination rounds, and advanced to the final when GottSpeed Racing rider Michael Ray fouled at the starting line. In the final, Hines combined a perfect 0.000-second reaction time and a 6.905-second ET to overcome the 0.026/6.886 pass of Arana Jr., and crossed the finish line 0.0077 seconds (approximately two feet) ahead of the Buell rider. Hines, who lost in the final round at Gainesville to Krawiec, now leads the Pro Stock Motorcycle division with 216 points. Krawiec is second with 210 points, followed by Arana Jr. with 184 points, Stoffer with 129 and Buell rider Matt Smith with 127 points. 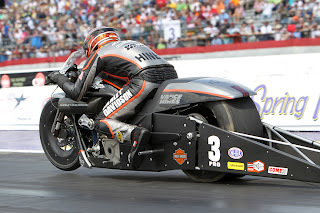 The Pro Stock Motorcycles will next race May 4-6 at the 32nd Annual Summit Racing Equipment NHRA Southern Nationals at Atlanta Dragway in Commerce, Ga.